The Molix Trago Vib Blade Bait. 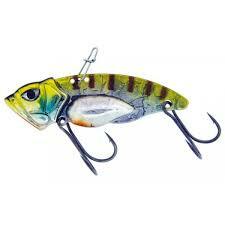 it’s a metal concept lure developed by Molix made with high quality materials. It’s excellent for vertical presentations or fast jigging retrieves. Properly balanced, it’s enhanced by a “side to side” action during free-fall. It’s painted with the new electrostatic painting system to insure maximum resistance and durability. Use a vertical jigging presentation during winter and fall seasons. In the spring and summer speed up your retrieve when fish are more active. Line Suggested: 8 to 12lb; Nylon, Fluorocarbon and PE. See here for other Molix products we inventory.